I was interested to read of your Portgordon connections, as I lived in that village some 50 years ago. Slackend farm, where Ann Green lived, is just outside the southern boundary of the village, and some of the fields of the farm reach the houses, and my old school. The farm house was about 1/4 miles from the village. As I remember it, Slackend was quite a small farm, with the usual mixed farming. I think that they milked cows - I can remember seeing a double fence with the inner one electrified in at least one of the fields of this farm so that the cattle could not be approached by other animals and would not be infected with Tuberculosis. The cattle were tuberculin tested and had to be kept isolated so that they would remain TB free, as required at that time for the sale of fresh milk. They also would have planted crops such as oats, barley, potatoes, turnips etc. The turnips and the straw from the oats and barley would be kept for fodder for the cows during the winter, when they would be kept inside in the byre (or cowshed). As far as I know, the farm should still be in existence and would be farmed as a small-holding. It is possible that at least some of the land has been sold for a small housing estate - I think that there were a few more houses at the top of the village when I last saw it. Slackend would be about 1/2 mile north of Slackhead, and is approached by a minor unsealed farm road branching to the right as you run from the cross-roads of A96 and A990, travelling towards Portgordon on A990. This small road reaches a dead end at Slachend farm. There also is a small narrow dirt track running from the farm northwards towards the school where I received my primary education. As I remember it, the word 'slack' in Doric meant a 'close' - an enclosed area or courtyard, or a narrow passage between buildings, but on looking up a dictionary, it can also mean 'a hollow, a dip, a dell', so that I expect that the two farm names come from their respective positions at the top and bottom of a hollow. I do not remember that there was much of a hollow over this ground, so it must have been fairly shallow. The Enzie area is two to three miles south of Portgordon, and Buckie is some 1 1/2 miles to the east, so all these folks lived within walking distance. I have no knowledge of the families mentioned, but remember an old fisherman named Peter Green who would have been in his seventies during the 1940's when he used to take my father and I out to sea from the Portgordon harbour to fish for mackerel. His was an old boat which was propelled by wind and sail only. Never-the-less, he was able to navigate the coastal waters with ease, and, although then semi-retired, made a living by catching fish and lobsters for sale. My father was the stationmaster at Portgordon at the time, and he got to know Peter Green when he sent his catch through to Aberdeen by train to reach the market for his lobsters. I think that the mackerel were mainly used for bait for the lobster pots, because at that time it was not a very prized fish! Hi Barry, At the risk of confusing the issue, I grew up to know two "Slackends". 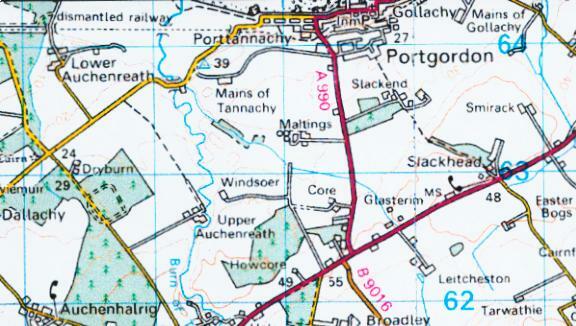 The first is clearly marked on any contemporary map detailing the main high road from Buckie to Fochabers. Only you will find it marked as Slackhead which is presumably its Sunday or proper name. It is a tiny collection of cottages and a now defunct general store/postoffice. We have always called it Slackend as it was situated at the junction of the main road to Buckie and the track leading to Slackend farm (Slackend proper) Of course you are referring to Slackend proper, the farm itself which would not be so easy to find on a map as it is not on the main road. It is located approx. halfway between what is marked on the map as "Slacked" and the village of Portgordon. It is linked to the outside world by means of a dirt track that is probably too insignificant to appear in most maps. With reference to the Greens, the only Green I have been able to place in the area, who farmed (where else) Slackend was a Mary Green. To the best of my knowledge she died in the sixties - the last in the line of the Green's of Slackend. I will need to confirm that with some of the older people still living in the district. In Portgordon there currently exists two hostelries, neither are called the "Portgordon Inn". I would not like to guess as to which one (if either) was the original inn but I look forward to the arduous research - any excuse for a beer - and will pass on any information I manage to gleam. Hi Barry, I have not thus far, found out very much more on Slackend. An old schoolfriend of mine who used to take tea with the Greens has been able to confirm that the last Green was indeed Mary and that she passed away probably in the early 1970's - a bit later than I had guessed. From then on the farm passed to a family called Farquhar who are still there today. I personally do not know the Farquhars or else would have contacted them directly for further information. As for the Portgordon Inn , it is not without irony given the amount of beer I consumed in researching this topic, that my current prime suspect for the original site of the inn was once the "temperance hotel", now a family house close to the harbour, could it be that the Frasers ran a "dry" house? This certainly would not be unheard off in the once staunchly religious fishing villages of North East Scotland. I will continue to find out what I can regarding the Portgordon inn and anything else about the Greens. This is as much for my own benefit as yours as I have learned much regarding my own heritage in conducting this research. In any event I look forward to hopefully joining you for a dram to toast your daughters nuptials in one of the Portgordon establishments at some point in the future. Yours Aye for Scotland A. F. C.
After the Reformation of 1560 the Catholic Church almost died out in Scotland. Nearly everywhere the people embraced Protestantism, some by conviction, some for other reasons, some simply for want of an alternative. For a short time in the early 1600s there was not a single Catholic priest in the whole country, and for much of the century there were so few that the Mass was often little more than a memory even to those who had remained Catholic. At the end of the century these still numbered less than 25000, a tiny fraction of the population. But even this figure is deceptive, because nearly all of them lived within a narrow swathe of the country that ran from the North East coast, through Lochaber and `The Rough Bounds', to the Western Isles. Elsewhere - in the South, the Lowlands, and the rest of the Highlands and Islands - there were almost none. Within this swathe Catholics formed the majority in many places, and in some virtually the entire population, where the people had remained loyal to the Old Religion, protected by their remoteness and their chiefs. It was here that the Catholic faith was saved from extinction, and from here that in time it began to grow again. But it was a poor Church, with few to lead it. And it was banned under the Penal laws, whereby even to attend a service was strictly speaking punishable by banishment. So recovery could only be slow and painful, achieved at cost, sometimes by heroic sacrifice. From the 1730s the Laws were rarely enforced rigorously, except for a few years after the '45 Rising, and in 1793 they were largely abolished. At about the same time the first trickle of immigrants were arriving in the Lowland towns from Ireland, many of them Catholics, and they joined the little native Church that had come through the dark days, and greatly added to its numbers. Some Catholic sites remain to remind us of the Penal era, but they take some searching for. Because the pre-Reformation churches had all been taken over or destroyed, the faithful had to worship in houses, barns, or even at Mass stones out of doors, and the few new buildings that they erected were small, usually remote, and deliberately hidden away. But it is these very qualities that are most striking, and express most powerfully the faith, hope, and love of those who worshipped there. They tell a story of struggle against the odds, which is a part of the story of Christianity in Scotland and a part of national heritage, and we can all - of whatever faith or none - admire them for that. From the travels of William Shepherd, 1922: Portgordon itself, the headquartcrs of the population of the area, must be a good mile long, and that it has prospered in material things may be argued from what appears be-fore us. The streets are tidy; tbere are, particularly in its eastern parts, a number or fine private houses, many of them with their fronts aglow now with white roses; and if in some parts of the country and in some circles Its name may be known chiefly by the products of one of the most famous poultry yards in the Kingdom, which has provided winners at national shows both in Scotland and England, it has for long held a high position as the home of a race of hardy and skilful sea-faring men, and as one of the leading centres in the North of coastal salmon fishings. The harbour, with its fleet of steam drifters, zulus, and haddock boats is, at the moment, seen at advantage, for there is high tide and the large basin is occupied by a magnificent sheet of water. Like other places, the fishermen of Portgordon have been of late handicapped in the prosecution of their industry through the miners' strike, but there are hopes of coal getting through in the course of the present week, and the fact is welcomed even although the price in prospect is in the region of £5 a ton. Fishing is practically the sole industry of the community, and there is about the place such a general atmosphere of comfort and enterprise as argues its remunerative character despite the passing cloud that depresses the industry as one of the aftermaths of the war and as a consequence of the impoverishment of European areas which provided formerly a market for the Scottish output of that wonderful, wealth-producing, democratic fish, the herring. Since the foundation of the village the sea has ever been the foster-mother of its energetic inhabitants. Portgordon, since it had improved harbour facilities at an earlier date, had for long in the sphere of shipping the lead of its larger neighbour of Buckie. In former days, when local shipping activity was in its heyday, Portgordon was the recognised seaport for Keith and a large inland area; from this small community has come a race of seamen that for enterprise and skill has proved inferior to none in the country; and today there are commanders of large vessels who claim Portgordon as their place of birth. In 1841 the registered tonnage belonging to the village was 3231; between 1860 and 1870 it is believed that the majority of the male population were sailors; and at one time in these years there actually belonged to it close on one hundred seamen who had passed the Board of Trade examination and were able to command vessels of any size to all parts of the world - a record, surely, for a place of the size it is; it was a common thing for the small community to receive during December an addition of 150 to 200 men home for the Winter whose pockets were as a rule well lined, so that they had no small influence on the business conditions of the place. Matters have changed since grain from Botriphrnie ad Boharm was shipped at Portgordon, since cargoes of foreign wood were unladen here for the busy shipbuilding yards of adjacent Speymouth, and since a dozen curers found scope for their energy in the raw material put ashore on the quays of Portgordon, but although, by reason of economic causes, local shipping has disappeared, the fine fleet or fishing vessels owned in the port proclaims how in this other department of the same sphere native energy and skill have been put to fine practical and profitable use, and in that beautiful war memorial yonder, unveiled the other day by the Duke of Richmond and Gordon, there is attested the grim courage in the sons of Portgordon of the present generation while battling with the enemies of their country. And as we leisurely traverse the village streets, there comes to mind one curious result of a local improvement, for when in course of years its houses came to be numbered, the alteration led to the disappearance for most practical purposes, in the name Portgordon, of what were three villages on three, different estates - Port Gollachy on the Cluny estate; Portgordon on the Duke's estate; and Port Tannachy, on the estate of Mr Steuart of Auchlancart, all popularly classed today under the name of Portgordon. A further extension of the little tour is made, this time to a cemetery, one of the oldest places of the kind in the locality it must be that are still used as places of sepulture. A signpost en the turnpike proclaims the situation - from Keith eight miles, from Fochabers three. There are skirted the spreading lands of the fine farm of Burnside of Enzie; over a trodden pathway on the Braes of Enzie, traversing a field that is now in oats, we come to the ancient place of burial, and a swinging wicket gate gives access to the cemetery of St Ninian's. It is old, but it does not look it, for it is tidy and spruce as one would wish such a place to be; it is surrounded by a substantial stone wall, and there is a great profusion of beautiful growing flowers - red and white roses there are, with such old-world plants as the fragrant thyme and the sweet southern-wood (our grannies never went to church without a sprig of southern-wood in the handkerchief they carried in hand) and there are a number of beautiful yews, all looking in their abundant greenery flourishing and well. The immediate district where we now stand has a very old connection with the profession of the Ancient Faith. I n this cemetery there was of old time a church, but all signs of it have long been swept away. A matter of 320 years ago - in 1602 - it was reported as being in ruins. On its site there was erected in 1687 another church, and you will see built into the wall by the main gate of the cemetery the keystone of the arch of the latter - it bears the figure of a cross, also "I. H. S. 1687" - it was in this church of 1687 that history tells of the little Marquis of Huntly serving Mass in 1728 while the family still maintained their personal connection with the old religion. The most striking stone in the cemetery is a beautiful Celtic cross of grey granite whereon are inscribed the names of a bishop and 26 priests who lie buried within the limits of what was formerly the sanctuary of the old church. The prelate buried there is Bishop Nicolson first Vicar-Apostolic in Scotland, born at Birkenbog in 1642, died at Preshome in 1718. Preshome was originally selected by the bishop in 1697 as his residence owing to the fact that it was distant only five miles from Gordon Castle, then a bulwark of Catholicism; for 20 years he traversed Scotland, exercising his episcopal functions and administering confirmation for the first time since the extinction of the heirarchy. In addition to the name of Bishop Nicolson, these are among the names inscribed on this remarkable memorial - Alexander Winchester, born 1628, pres.1658, died 1708. Joannes Irvine, pres.1679. Petrus Reid, born 1672. Carolus Ralston, born 1808, died Presbome 1833. Joannes Fraser, died Preshome 1837. Jacobus McLachlan, born Cabrach1771, died Preshome 1846. Jacobus Clapperton, born Fochabers 1813, died Fochabers 1901. Canon Weir, born Buckie 1831, died Fochabers 1917. Jacobtis Donaldson, pres.1608, died 1740. Alex Paterson, born 1685. Georgios Gordon, born 1692. Joannes Forbes born Strathaven 1792, died Elgin 1855. Gulielmus Robertson, born Fife-Keith 1829, died Fochabers 1857. Gulielmus Gavin, born Galloway 1787, died Auchenhalrig 1859. Joannes Paul, born 1851, died Keith 1907. Allanus Canon Macrae, born Strathglass 1835, died Portsoy 1912. Donaldus Chisholm, born Portobello 1847, died Aberlour 1917. Joanes Propositus Kyle, born Weedon 1828, died Preshome 1917. Joanes Godsman, born 1698, died 1769. Alexander Godsman, pres.1742, died 1770. Petrus Hay, pres, 1781, died 1783. Terentius M'Guire, born Co. Cavan 1799, died Fochabers 1869. Jacobus Burns, born Glasguae 1843, died Elgin 1875. Joannes Kemp, born Enzie 1825, died Dufftown 1882. Gulielmusfi Clapperton, born Fochabers 1821, died Buckie 1905. David Burnet. born 1638, died 1695. Alexander Leslie, born 1650, died 1707. Gulielmus Reid, born Enzie 1755, died Kempcairn 1825. Georgius Matheson, born Fochabers 1756, died Auchenhalrig 1828. Alexander Grant, born Glenlivet 1804, died Portsoy 1833. Gulielmus Loggle, born Buckie 1921, died Tynet 1885. Gulielmus Smith, born Cuttlebrae 1830, died Oxhill 1898. Gulielmus Mann, born Banff 1819, died Portsoy 1900. "To the memory of John Stuart, late of Bogs and of Jean Lindsay, his spouse, and of their daughters Heitrietta, Barbara, Jean, Katherine, Mary and Charlotte, all of whose remains are here interred. Erected at the desire of Barbara, the last surviving daughter of the family, who departed this life on the 20th of August1823, in the 86 of her age, aud whose benevolence, charity to the poor and amiable manners gained her the general and just respect and esteem of all ranks of society where she was known." I hope to have a joyful rising from the grave." There are old and interesting associations not a few, therefore, with this ancient place of burial. Both its old churches have gone, but much remains to tell some forms of the story of the district, although one is struck by the comparative absence of very old stones in so ancient a place of sepulture. Three or four are built into the wall at its south eastern corner, but beyond these there do not appear to be other ancient survivals - they may have been swept away when the cemetery was remodelled and improved; we cannot tell. But the old place remains to inform the seeing eye of a historic past. The changes that time has wrought have made its situation peculiar, in the centre as it is of a cultivated field, but both in the immediate environment and all around there is still presented a scene of inspiring charm. To the north, glimpses are had of the Moray Firth; the fragrant woods and fertile fields around Clochan are to the cast; to the south are the spacious Braes of Fnzie, disappearing in wastes of hill and heather; and westwards where the slanting sun gives notice of the lapse of time are the richly wooded hills around ever charming Fochabers. It has other and more intimate associations, for this old cemetery may be said to he the centre of a district which has been extraordinarily fruitful in vocations to the priesthood, and most remarkable for the number of bishops it supplied to Catholic Scotland: during the past century no less than eight bishops were natives of this little district of Enzie. That may, perhaps, however, be more fitly referred to somewhat.